Guitar and Bass Download Do you want to learn to play guitar or electric bass , but you do not have time to go to an academy ?. Do not worry, we put at your disposal a free pc program developed for those who want to learn to play these instruments from the beginning with your computer in a virtual way. This is Guitar and Bass , a very complete program to learn guitar and bass. With Guitar and Bass you have a great simulator of these two instruments, as well as two others such as mandolin and banjo. Actually Guitar and Bass has a total of 7 instruments to choose from , all of them with a very similar learning procedure. You can open tablatures in text format besides editing them to be able to progress in your learning. 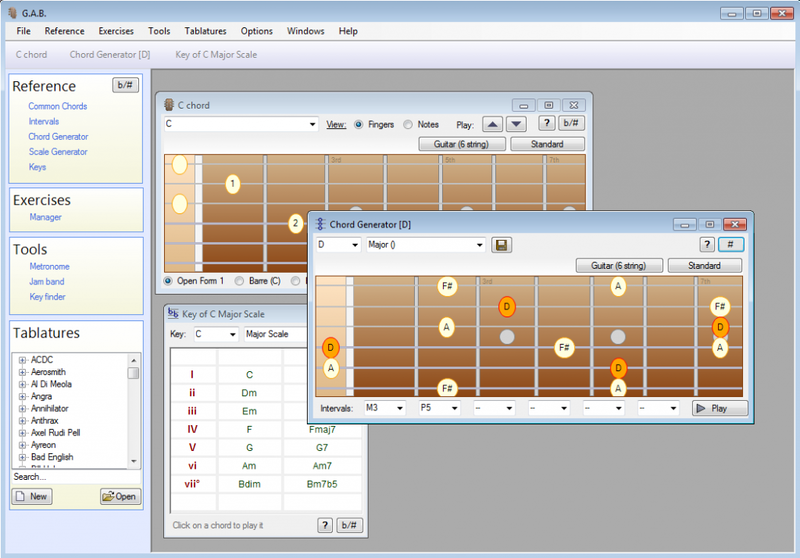 It shows you all the chords, colored as well as the position on the guitar to facilitate you learning the chords, a very important part in learning any instrument.